I’m off to the Isle of Man soon for the second time. Sadly, my teaching and other work commitments, not to mention the family ones, mean that I won’t be able to go long enough to see anything further of the island’s wonderful landscape and heritage sites beyond the small snapshot I got for the first time last year. My trip will be taken up with going to the Isle of Man College to do some teaching, have some meetings in my role as the Dept of History and Archaeology at the University of Chester’s link tutor for the BA History & Heritage run through the college. I will also be giving a public talk about my research on early medieval smiths. I’m thinking back to my visit of last year when I got to see Maughold’s early medieval stones, Balladoole Viking boat-burial and the Manx Museum. 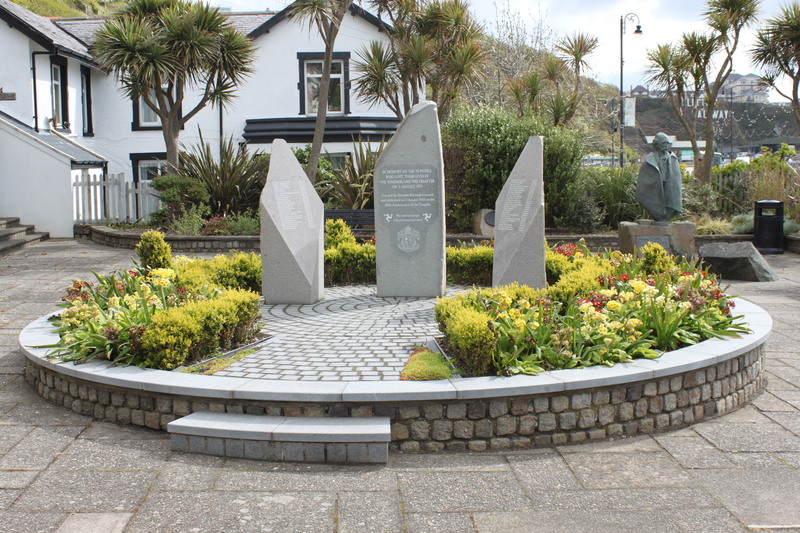 I also encountered a striking memorial to a unique and harrowing fire that took place on the outskirts of Douglas 40 years ago: the Summerland disaster of 2 August 1973. The innovative hi-tech leisure centre was opened in 1971. It went up in an ‘inferno’ on the evening of 2 August 1973. The disaster was facilitated by multiple failings, including a failure to evacuate immediately, no call for the fire brigade for 20 minutes and some locked fire doors. The building itself was inherently problematic; employing flammable materials in its design, with numerous open spaces and other architectural dimensions facilitating the rapid spread of the fire. A stampede for the main exits caused many deaths by crushing and trampling. Details of the disaster can be found here, here and here. 50 children, women and men – many holidaymakers – were killed. Recent articles do not list the numbers injured. It has been described as the biggest civilian fire in these islands since the Blitz. The fire has a prominent place in the island’s history but is regarded as something of a ‘scar’ and a ‘shame’ on the Isle of Man. Fire regulations for buildings were changed but there were no prosecutions for a fire started by teenage smokers in an adjacent kiosk. The horror of the incident is enough to make anyone want to forget. Collective shame also breeds forgetting. Moreover, the profit motive of tourism breeds a culture of forgetting too surrounding the deaths of tourists. The Summerland fire could be seen in these contexts, and it has been regarded as among the most trivialised disasters in the history of the British Isles. The centre itself is now a ‘scar’. The centre was rebuilt in 1978 but it is now an empty space following demolition a decade ago. 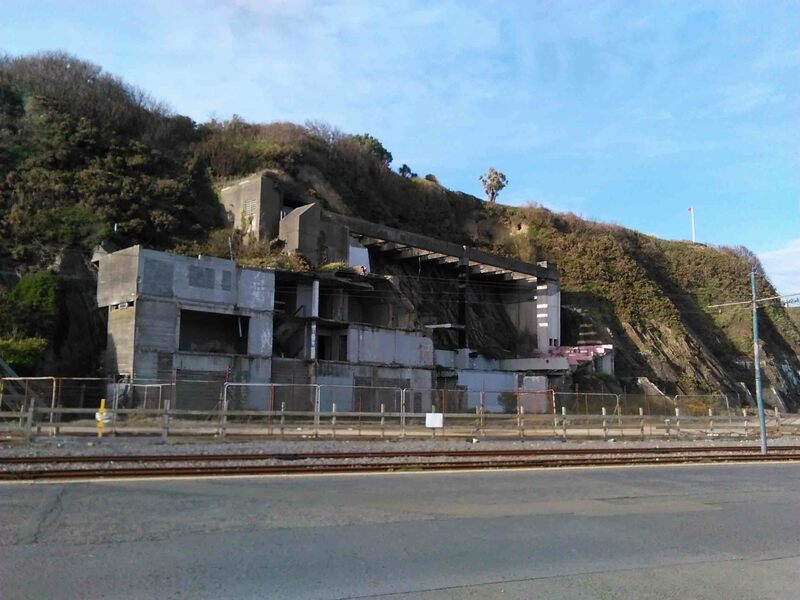 It is also not completely gone but instead it is a part ruin: its west wall still in place for fear that its removal would cause the cliff behind it to collapse. Perhaps its redevelopment will facilitate ‘closure’/’forgetting’, but for now, there is at least finally a memorial. 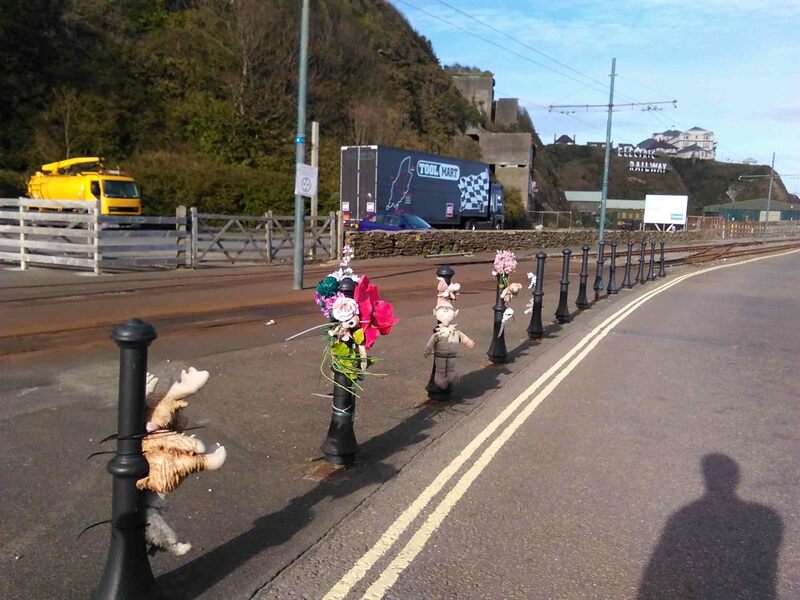 There are toys and flowers along the bollards on the approach to the ruin, between the Manx Electric Railway and the road, although I’m told these relate to a later accidental road death. 40 years after the disaster, a monument has been raised to commemorate the fire. 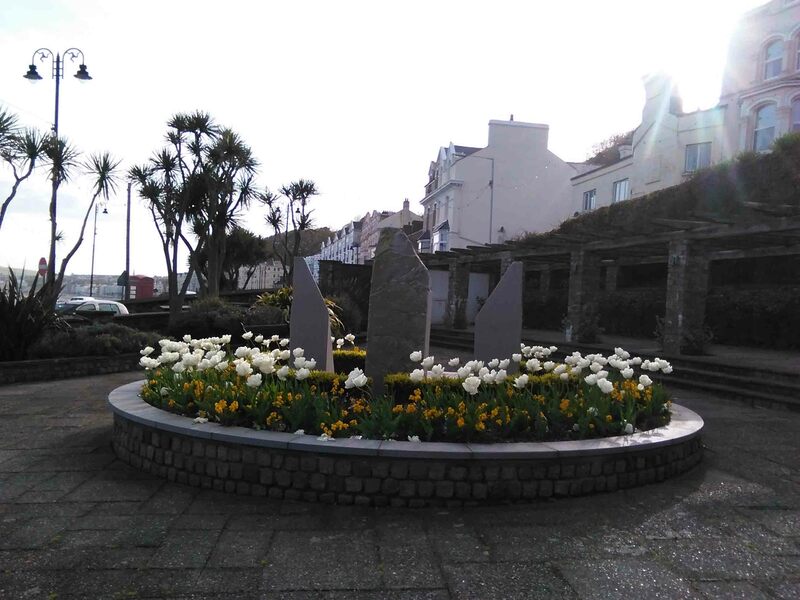 It was unveiled on the evening of Friday 2 August 2013, situated within the existing Kaye Memorial Garden in Douglas, a space opened to commemorate Alderman Kaye in 1955. It is close to the sea and close to the Summerland site. Notably, the site chosen for this disaster memorial was an existing memorial environment in an angle between the coast road (King Edward Road) and Summer Hill Road. the memorial augments a memorial environment and there is a small plaque set up to commemorate the 25th anniversary. Subsequently, a plaque was placed on a small low stone beside the plantings commemorating the 25th anniversary of the disaster in 1998. The choice of location was therefore building on a clear precedent established in 1998 for commemorating the disaster at this location. The opening ceremony was attended by families of the victims (see also this report), the names of victims were read out, and some perceived it as bringing closure in itself. 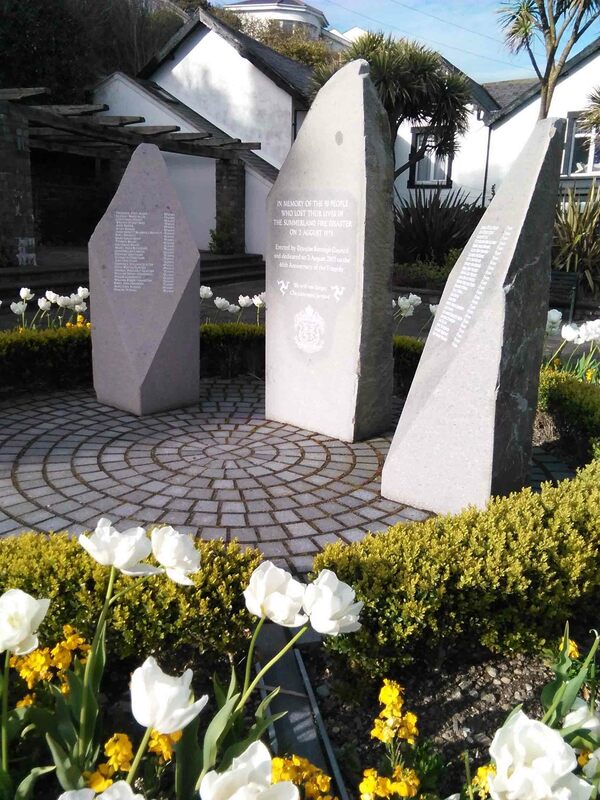 The monument is granite and comprised of a trio of stones set within a raised circular walled garden; a garden within the existing memorial garden. 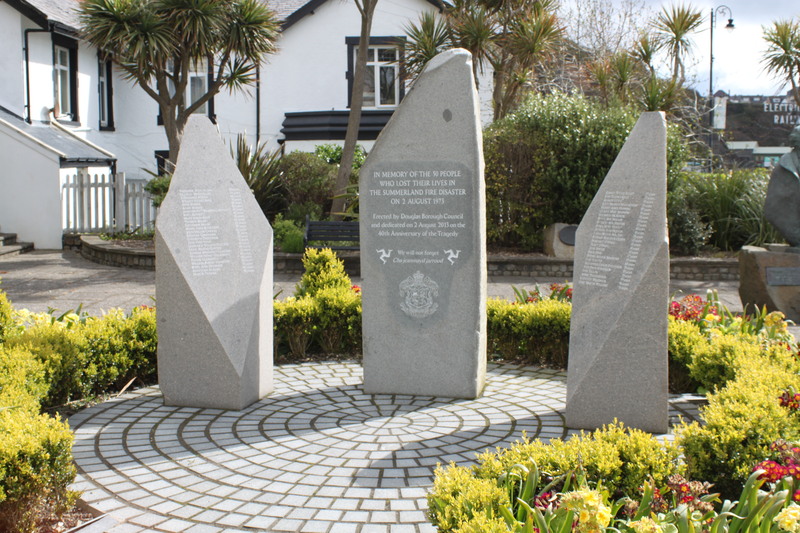 Beneath the memorial is the town’s crest, and two triskeles (three armoured legged symbols that are the centrepiece of the islands coat of arms) are present too. There is a sense with such disaster memorials require a discourse of neglect before memories can be rehabilitated and an anniversary ‘closure’ can occur. On this occasion, the discourse seems fully justified. I cannot imagine what 40 years feels like for the families of the victims, other than ‘way too long’. The lack of memorials can breed a shame of their own, growing alongside that of the disaster itself in public consciousness. The comments about the toys and flowers being left on the bollards “for children who died in the fire” is completely wrong. Very upsetting for he family of the little boy who was run over by a car at this spot some years ago, and absolutely nothing to do with the Summerland fire. This needs ro be corrected. Thanks for letting me know Caroline. Do you have references to that death? The toys ARE FOR my God son liam. HE was 4 years old when HE got run OVER. My brother who was eighteen and his friend seventeen died in the fire. They were visiting me as I had moved here previously with my Man husband, and I had just had a baby boy, so theywere visiting me to see him, and both died in the fire. They are buried on the island. Thank you for this. My life now is pretty hellish probably mostly because of what this did to my family. I’m so sorry to learn about how this affected your family and there’s nothing I can say in this context in response to your message, other than to thank you so much for commenting. I do feel strongly that memorials such as this need to be recognised and we consider how they serve, or try to serve, to providing a lasting memorial to those affected by such a devastating tragedy.